The DigiTech iStomp is an entirely new concept in pedals. It works just like a traditional stompbox with one huge exception. It can be completely reconfigured by loading it with any of the 26 (and growing) e-pedals available in the Stomp Shop app. See what the new world of e-pedals can do for your music. Connect the iStomp to an iOS device using the DigiTech Smart Cable. In about the same time it takes to download a song, you can completely reconfigure the iStomp with any e-pedal from your virtual road case using the Stomp Shop app. Disconnect the Smart Cable and you’re ready to use your iStomp just like you would any traditional pedal. The DigiTech Stomp Shop app is free from the App Store. 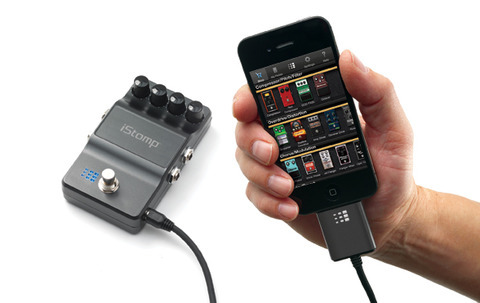 It allows you to browse, try out, and purchase e-pedals for the iStomp. Download it now! There are 26 different e-pedals to choose from with more being added each month. Each iStomp comes with two e-pedals-Total Recall digital delay and Redline overdrive. The first time you connect to your iStomp you can choose one more e-pedal from the different DigiTech pedals for only $0.99. After that you can download new e-pedals for as little as $0.99. Some of the e-pedals available in the Stomp Shop are listed below. DigiTech Rock It Distortion-Highly versatile distortion that works great with clean and overdriven amps. JUST ADDED Sound-Off - Momentary switch that completely shuts off the audio signal similar to the on/off function of some guitar pick-ups.